The Pirates of Pudding Hollow. Thanks to Phyllis Gotta for the photos on this post! My friend Peter Beck called my attention to a piece in the style section of The New York Times last Thursday about the popularity of pirate attire. Pretend pirates apparently frequent coastal resorts. 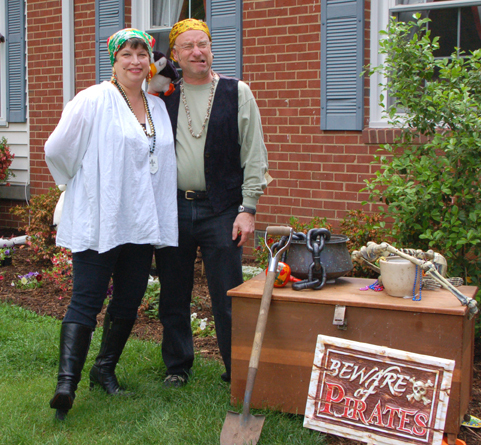 Pirates were also seen in and around homes across the nation last week. 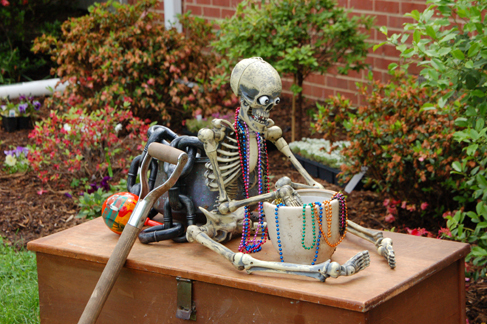 Times writer Michael Brick noted that pirate ensembles have become the fifth most popular Halloween costumes for American children and adults, beating out both zombies and Hannah Montanas. Peter knew that I had inserted pirates into the entertainment for my annual charity pudding contest. The story we enacted, supposedly found in a vault in the Town Office here in Hawley, Massachusetts, told of a visit to Hawley by pirates in the late 18th century. 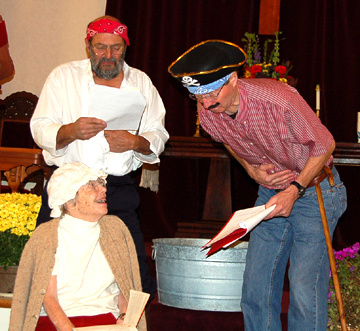 The cutthroat band was in search of our town’s most famous comestible, pudding. 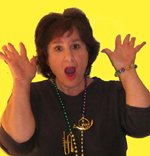 The truth is that I didn’t actually know it—at least not before I saw the contest entertainment. 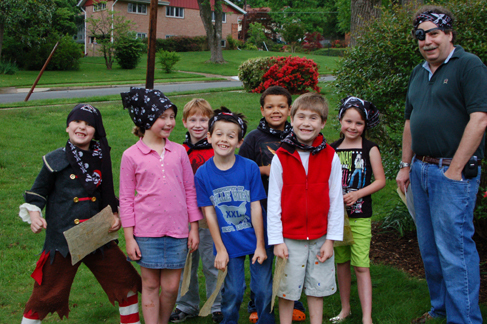 I mainly wanted to recycle some of the props from my nephew Michael’s eighth birthday party, which had a pirate theme. 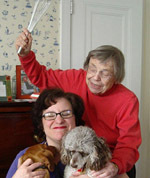 The pirate party was the brainchild of our cousins Jane and Alan. When I saw our pirates on the stage, however, I realized that I had stumbled upon archetypes that appealed hugely to amateur actors and to the public at large. Our pirates threw themselves into their parts—leering, fighting, and of course yelling “Arrgh!” a lot. The audience was charmed, and the other actors were inspired. 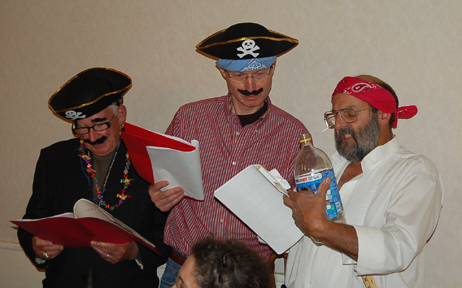 The pirates are lobbying heavily for a return engagement in next year’s entertainment. 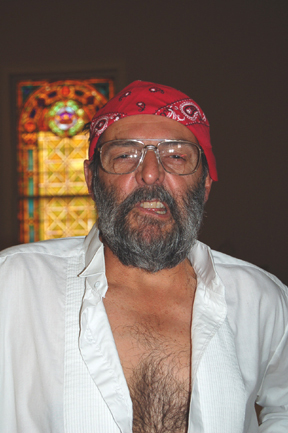 Michael Brick quoted one of the pretend pirates he interviewed on the appeal of faux piracy. “It’s this idea of being able to go out and do whatever you want and be whatever you want and throw all these morals away and not care about the law, when in reality you can’t,” a 19-year-old pirate told the reporter. Pirate John hams it up pretending to be sick. Like witches, gangsters, gypsies, and wild-west gunfighters, pirates appeal to mainstream Americans because they exist to some extent outside of our culture and our laws. We don’t really want to sail the seas nonstop or make people walk the plank (not most people at any rate; I do have a few candidates in mind). We certainly wouldn’t care for pirates’ limited diets or their even more limited standards of personal hygiene. What we do want is a little license to play–to shout, to pose, to dress up, and to be intimidating without actually having to intimidate anyone. 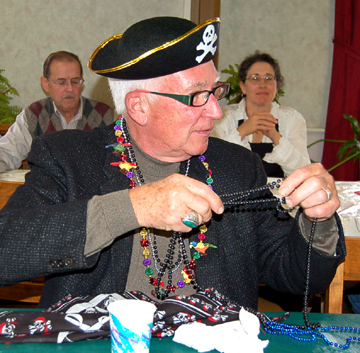 Pirate Michael accessorizes his wardrobe. Pirate lore is also appealing because, like the knights of the roundtable or Indiana Jones, pirates are on an eternal quest. I don’t know anyone who has ever seen, let alone dug up, buried treasure. But that two-word phrase bears a strong romantic appeal. Treasure trove is something we may dream of all our lives but never find. Thinking of it gives us all a little license to dream, however. And a dream, as our new president elect could tell us, is a pretty useful thing. Here is last year’s pudding-contest entry from our pirate captain, Ray Poudrier. The pudding’s name fits in nicely with the piracy of this post. 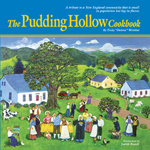 Ray says he almost called it “Bachelor’s Pudding” or “Pudding for Dummies” because it uses so many packaged ingredients. I hope readers deem it appropriate pirate fare. Captain Ray has a HUNGER for pudding! Prepare the gingerbread according to the package’s directions. Cool it; then slice it into 3 layers. Heat the rum and raisins in a microwave oven for about 3 minutes. The raisins should soften, and the rum should be reduced. Prepare the butterscotch pudding according to the package’s directions. Cool it slightly. Drizzle the bottom layer of gingerbread with a third of the reduced rum. Pour about 1/3 of the butterscotch pudding on top. Place a second layer of gingerbread on top. Drizzle that layer with 1/3 of reduced rum. Pour another 1/3 of the butterscotch pudding on top. Pour on the drunken raisins and remaining reduced rum. Place the third layer of gingerbread on top. Drizzle the top of the gingerbread layer with remaining pudding. Add caramel topping in open areas of cake, if desired. Allow the cake to rest overnight. Serve with whipped cream if you like. Serves 9. Some of the Birthday Party Pirates!